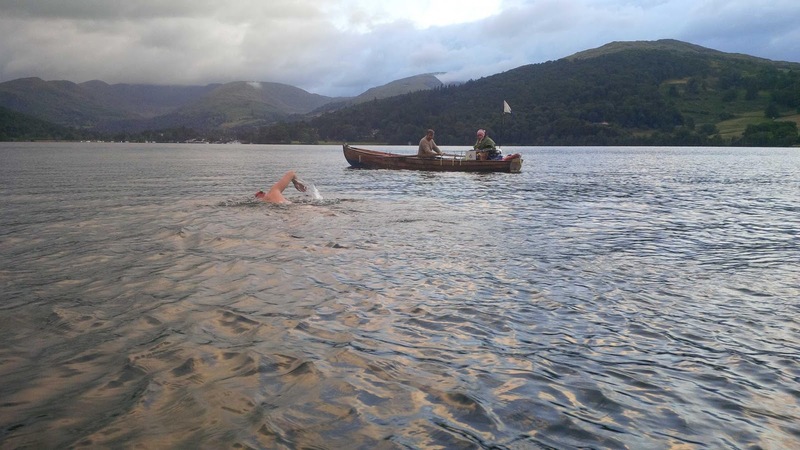 The longest swim of the year on the 2013 BLDSA calendar, the legendary 21 mile 2-Way Windermere. Similar length to the Channel with less buoyancy and the swimmers having to take it head-on predominantly during the hours of darkness to ensure fewer users to contend with on the water. Again, I had been able to hire the greatest oarsman on the planet, Mick Macarthy, who had guided me on Loch Lomond and the single Windermere so expertly. Also roped in the great Louise Bingham who is a superstar Chief Fundraiser for the Rainbow Trust – the charity I’d raised £5k and £8k for in the previous 2 long swims and she was cornered into experiencing a one night stand (more like sit) on an uncomfortable boat with a man she had never met before! They were both awesome and without them just turning up wouldn’t have happened. Needless to say previous crewman Kev has been relegated now to the subs bench as Mick confirmed ‘I’m not rowing one of these events ever again unless Louise is there….’ (Sounds like they got on ok then..). Photo of limping gimp with the so-solid crew before the onslaught of relentless mullering! An eventful train journey for the swimmer and crew bumping into our new friend Gill Dixon who was returning to Ambleside after visiting her daughter down south as Gill had very tragically lost her son-in-law within 1 month of being diagnosed with cancer. Struck another chord with me after my escapades in the Marsden only 9 months previously and all the extensive surgery. Meeting Gill and hearing her story certainly was inspirational in learning how they are all trying to cope and provided me with a mountain of mental fodder to keep me going during the swim. If you live in the lakes and don’t know Gill, you should as she is an absolute rock star and even turned up with her husband at the start line to wave us off. Thanks Gill. Taxi-driver 'uncle' Howard (who I've known since starting my swimming career in 2010 with a Swimtrek in he Lakes) dropped us off at the Waterhead Youth Hostel for grub as heard that the new food menu there is good and cheap. First schoolboy error of the day from boy Sheridan ordering a slightly dodgy cheeseburger and chips which wasn’t going to be the easiest thing to digest. What a loony. Why on earth didn’t I go for the veggie lasagne...idiot. We then rocked up to the beach start area and had a couple of hours for the crew to get the rowing boat capable of a night’s ordeal, hot water filled into pump-action thermoses and then attend briefings. During the swim briefing we were told the story of how Captain Webb came to Windermere in the 1800s to do a demonstration swim but got out early due to the lack of buoyancy! By the time came around to get undressed into budgies, there must have been what seemed like hundred people milling around (not including all the restaurants, bars and punters on the ferries) watching the 3 swimmers off at 5.30pm (me, Kevin Welsh and Jo Norton-Barker (4 faster swimmers due off at 7.30pm)). I remarked to Jean Wilkin-Oxley that the crowds were a far cry from the start of Loch Lomond which was more of a ‘one man and his dog’ affair. Even had a surprise appearance from legend in open water swim circles,Karen Throsby, and Denise from the Cumbria care team of the Rainbow Trust. They both remarked how relaxed I looked before I was to take on my 21-mile fate. I reminded them that after limping around all year long, struggling with stairs, falling over loads and generally being ungainly on land, this swimming lark was very much my paddock now where I could still be remotely super-human and feel normal or liberated in some way. And then we were off. Making headway out into the main channel of the northern part of the lake through the moored boats into a reasonably stiff breeze that moments earlier had boats really healing over in a major way. Steady progress made and 1st feed as all 3 were pretty much the same pace in a line. Managed to ease ahead as we passed Bass Rock on the western side after Wray Bay and had Belle Isle in our sights. The water was heavenly and must have been 19 degrees after the wonderful summer heat wave that the UK has experienced. Went through the Lilies and down towards the Ferry and couldn’t believe that we were half way down the lake in 2hrs 50 mins!! Once passed the ferry, the lake again exposed us more to the wind and after (2-Way Windermere 2009 veteran) Thomas Noblett came over to say ‘Hi’ from the rescue boat, we were shortly greeted by darkness which seemed to come down rather too rapidly for my liking. It was only 9pm-ish. I had completely forgotten how utterly mentally tough it was to swim in the dark relying solely on the crew and the glowsticks on the boat or vague lights in the distance for direction. Next thing we knew, there were a few squalls and the rain was coming in horizontally - I saw Mick scramble to put a coat on over his T-shirt..... I did smile to myself rather smugly in the water that I wasn’t getting any more wet than I was already and was much happier in the water than I would have been on that support boat. The water was WAY warmer than the outside world - probably to the tune of 10 degrees Celsius warmer! Mick’s 10-odd wagon wheels must be sodden now I thought! Gradually we ground our way down towards Fell Foot at the southern end and I started to feel nauseous. I was feeding off my usual Maxim mixture and the odd bit of banana, potato, jelly baby or milky way but none of it could shift the discontent feeling which I can only put down to that lousy cheeseburger in Waterhead before the swim. Needless to say we finally rendezvoused with the kayaker who was to take me round the turn buoy and re-unite me with the crew. I looked at my watch and by the time I had got back to the support boat it was precisely midnight. Under 6 ½ hours for a length of Windermere left me pretty content given it took me 7hours 5 mins to do the single not even 2 years previously (and that one was with a prevailing wind). Reminded myself how chuffed I was with my technique and that all I now had to do was keep turning over the arms and every stroke was taking me back up nearer the finish and tea & medals. I was the first one round the turn buoy and then could just about make out most of the other crew boats escorting swimmers down to this southern end.... I still felt sick and then told the crew that I just wanted water for a while with the odd jelly baby. Gradually the darkness was eroded by daylight which gave all of us a huge lift in spirits. The shoulders were painful but the level of pain had completely levelled off and could pick up the pace a bit more. Louise had expertly recognised that after refusing maxim for 2 hours and only drinking water, I was flagging and ordered me to have maxim and a milky way. It was absolutely spot on and my energy levels were replenished and finally didn’t feel so sick (must have finally digested that sodding burger!). At 5.30am it was now light and we passed Bass Rock on the way back up north & into the main channel and crossing ‘The Deeps’ with only the final slog and cross wind between us and the finish. I was beginning to flag and lose motivation but precisely right on cue to snap me out of my dizziness were Thomas Noblett and Andrew Tighe from the Langdale Chase on their 2-man canoe. 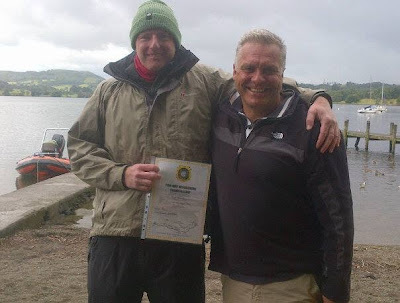 Thomas had been inspirational to me in taking up the sport in 2010 after completing his own 2-way Windermere in 2009 which was show on the TV programme ‘The Lakes’. The Gladiator and Admiral as they are known were now escorting us too so had to keep hammering along as fast as possible. Before we knew it, we rounded the final Steamer jetty at Waterhead and into the finishing line. 13 hours 29 mins and way ahead of expectations. Round of applause and relief all round. Andy Wright, in his dry suit, helped to pull me from the water as I struggled to exit up the rocks and in typical fashion every muscle in unison started to cramp. Thank god that ever-present Pat Llewellyn and Louise were on hand to help dress me as I felt dizzy and utterly pathetic as all my stomach muscles cramped at once. Just felt humbled again by the BLDSA & support crew who gave up all of their weekends again (not to mention much personal expense) all in the desire to further the ancient art of long distance swimming. The BLDSA family were there in numbers to welcome the swimmers home with huge smiles and applause as they knew how much it meant to the individuals completing such an epic event. Thanks guys. Another weekend where without the BLDSA volunteers, the event would not have been possible. Here I am being inaugurated into an exclusive club of those who have completed by Thomas Noblett - even coming a surprising 2nd in the men's race (2 men completed and 2 DNF). >>Below I have attached the views of Louise Bingham, Crew Member, who sent the following to her colleagues as soon as she got back to work of the whole experience!! In November last year, only a month after Mark underwent major surgery to remove a tumour from his abdomen I got the call to say he was planning on taking on the 22 mile open water swim, organised by the BLDSA and he wanted me to be a member of his two man crew. After everything he had done for Rainbow Trust, the money raised, the support during our time with Nomura, as well as the surgery, how could I say no? We set off from London Euston at 10.30am on Saturday, carrying everything we needed by hand, a surprising large amount considering we were leaving the south for little more than 24 hours! I met my other team member, captain of the ship, and third time rower for Marks swims, Mick. The train journey was spent reading out the messages of support and inspirational stories sent by various members of care and FR/M team. After arriving in Windermere, having a large lunch and getting full instructions on my role as part of the crew we headed to meet our boat. As you can see (from the photo's above), when I say boat………….. It is at this point I would like to say a massive thanks to Denise who (despite not finishing her packing for her family holiday to France the next day) came down to surprise Mark shore side with a stunning piece of artwork done by some of the children supported by the Kendal team, along with cards and messages of good luck. Mark was totally overwhelmed that Denise had come to see him off and wish him well, it was a lovely touch for him. Mark entered the water at 5.30pm Saturday evening, after getting greased up (another one of my jobs!!) Mick and Myself, along with all the gear needed to see him through, where just slightly ahead of him. My role in the crew (apart from occasional rower and maker of tea for Mick) was to make up Marks feeds and call him in every 40 minutes to take them, along with the occasion bit of banana, a jelly baby or sometimes even a mini milky way! There are many rules around the swim, including not touching the boat at any time and treading water to feed. If you look at a map of Windermere, we started at the top, went all the way down and came all the way back again. It's not a straight forward lake, there are many islands to navigate, a ferry to avoid and some crazy shoreline to lookout for. As the sun went down, we lit up the boat for Mark to follow with glow sticks, these sat below our eye line so we could adjust our eyes to the dark, Mark had a small green light on the back of his goggles so we could keep an eye out for him. I had a head torch that went on when I made up feeds and Mick had a small torch for checking the map when needed. On occasion we got a visit from the support boats, two high powered RIBs that came to check we are ok. Apart from that, mostly, we were on our own. There were only seven people undertaking the challenge, all with their own support crews, four setting off at 5.30pm and three at 7.30pm. Two gave up after they got half way. Navigating/rowing a boat in complete darkness, with the only noise being marks rhythmic splashing and the flickering of his green light as he turned his head to breath is quite a feat. Then it rained! Three times! It took six hours 29mins to get to the bottom of the lake, and another seven hours to get back up to the top again. Apart from treading water for about 30 seconds, every 40 minutes, Mark never stopped. We watched his green light constantly during that time, occasionally reminding him to follow the boat when he veered off to close to moored pleasure boats or headlong into the various buoys along the route. As the night faded and the sun came up (behind the clouds) we continued on our journey, back towards the shore at Ambleside. It was kind of like the life of pi (if you take away the angry tiger!) as per the picture above. Just before 7am on Sunday morning Mark made it to shore, knackered and very cold. 13 hours and 29 minutes taking with it the silver medal. His crew, slightly damp, a little tired and a tad delirious followed him in. Watching Mark keep going for that amount of time, was amazing, the man is a machine! Especially if you take into consideration the guy has no use of his left quadriceps (thigh muscle) as the tumour was removed from his femoral nerve, so he swims using his arms and right leg only! And despite the wind, choppy waters, rain, lack of sleep and numb bottom – it was worth it to see him crawl out the water with the biggest smile on his face. 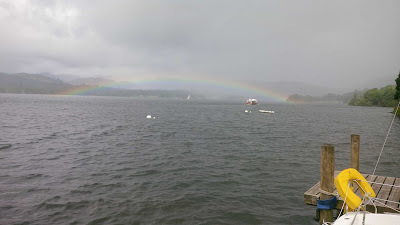 And, as if by magic, a Rainbow appeared over the lake! After his operation Mark was told he will always walk with a stick and he will never swim any kind of distance again, but he did, and he plans to again…….. the Channel in 2015!